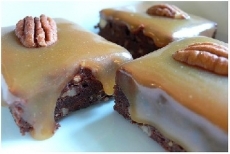 Have you made Caramel Chocolate Brownies? 2. Measure out 1 cup and set aside. Finely chop remaining walnuts. 3. Preheat oven to 350 degrees F In a medium bowl, beat together 1 stick butter, sugar, eggs, and vanilla with an electric mixer on medium speed until light and fluffy, 2-3 minutes. 4. 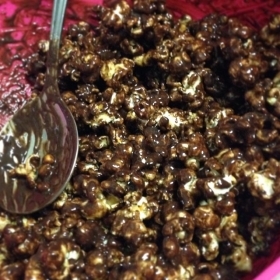 Beat in melted chocolate. 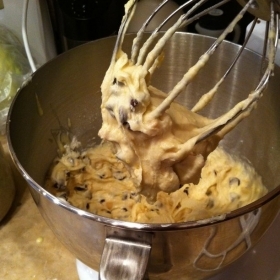 Add 2/3 cup flour and beat until well blended. 5. Stir in finely chopped nuts. 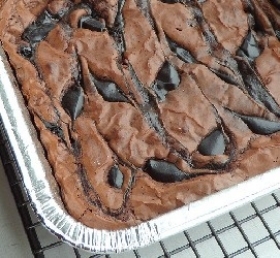 Spread batter evenly in greased, foil-lined 9x13-inch baking pan. 6. Bake 10 minutes. 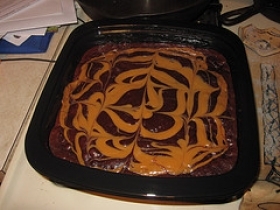 In a small bowl, mix together caramel and remaining 1/4 cup flour until blended. 7. 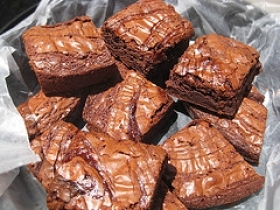 Drizzle over partially baked brownies. Sprinkle coarsely chopped nuts over top. 8. Return to oven and bake 20 minutes longer, or until bubbly. 9. Meanwhile in a 1-qt. glass bowl, heat chocolate chips with cream and remaining 1 tablespoon butter in a microwave oven on High 1-1/4 to 1-3/4 minutes or until smooth when stirred. 10. Set glaze aside. 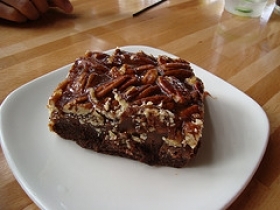 Let brownies cool 15 minutes. 11. 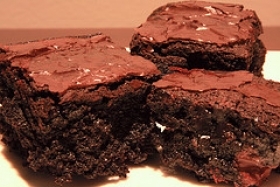 Spread glaze over brownies. Sprinkle coconut on top. 12. Refrigerate 1 hour, until glaze is set. Carefully cut into 36 (1-1/2 x 2-1/8-inch) bars. This recipe contains potential food allergens and will effect people with Wheat, Egg, Tree Nuts, Butter, Gluten, Walnuts, Natural Sweeteners, Fructose Malabsorption allergies.